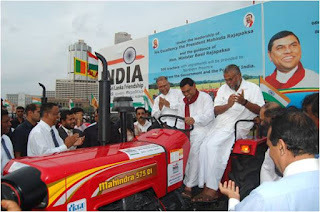 November 16, 2010, Mumbai: The Government of India recently donated 500 Mahindra tractors to the Government of Sri Lanka to help the rural population in North Sri Lanka. M/s DIMO, the Mahindra dealer in Sri Lanka, was awarded the contract for supply of these tractors. The first batch of 52 tractors out of the total order of 500 was handed over by HE, Mr. Ashok K. Kantha, the High Commissioner of India in Colombo to Mr. Basil Rajapaksha, Minister of Economic development, Sri Lanka. The ceremony was attended by Hon. Rishad Bathiyudeen, Minister of Industry and Commerce, Hon. Dogulas Devananda, Minister of Traditional Industries and Small Enterprises Development and Major General (Retd.) G. A. Chandrasiri, Governor of Northern Province. All the tractors come with a complete set of farm implements, namely, 9 Tine Tiller, Rotovator, two furrow Disc Plough and cage wheel. “We are delighted that the Government of India has chosen to donate Mahindra tractors to the Government of Sri Lanka. The Mahindra Group has a long and enduring association with Sri Lanka which is an important market for us and this is our way of helping in the nation building process,” said Mr. P. N. Shah, Chief Executive, International Operations, Automotive and Farm Sector. Mahindra has already established a base for itself in Sri Lanka where it has been selling its range of tractors and utility vehicles for over a decade. The Group now plans to further consolidate its presence by foraying into the hospitality and finance sectors. Mahindra tractor models 575 DI and the 605 are very popular in Sri Lanka. Future plans include a focus on expanding the range, offering agricultural implements along with tractors and increasing the service network to serve customers better. Does Mahindra thinks that there are no poor rural farmer in India are left, so that they got in Shrilanka. Why don't we ever think for India. Ya definately you want to grow your business in Shrilanka. That should definitely aid Sri Lanka.This is a very good gesture by the Mahindra group indeed.Yes true that there is also a great need for the same back in their own place of belonging which is India.